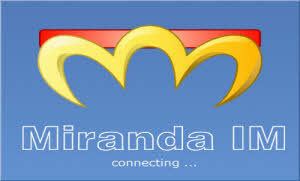 Miranda IM is a free instant messaging that can simultaneously use multiple networks - AIM, Jabber, MSN, Yahoo and AIM. If you want to keep in touch with friends using different Instant Messaging it is a very good solution. A large number of plug-ins and configuration options will appeal to more advanced users with instant messenger. After installing the program, Miranda IM asking for your password, which you use in instant messaging. If you want to open an account in one network, you can do so by clicking the link in the program. Wizard setting takes your contact list from the server or from the files of the original messenger network. Alternatively, you can manually add your friends, if the list is not available. All my friends are now available in a single list - to contact them, click on the nickname your friends on Miranda IM. This list also shows the status of the availability of friends, you can also expand photos and additional information. Miranda IM is a simple and lightweight program that can be easily expanded with thousands of available plug-in that allows you to change the look, or the use of messaging enhancements.